So I arrived with my rental in Verona and it turns out that you need coins to pay for parking. What is the best way to exchange bills to coins? At 1€ an hour 14 hours a day I need a bunch - not just what you get from buying coffee with 10€ bills. Enter a bar or supermarket and ask if they can change your 10€ bill into 1€ / 2€ coins for the parking. Repeat again in some other place. Probably they will stare badly at you. You're not obliged to consume or buy anything. Be warned that some cashiers may refuse your request. This is a common behaviour even for italians. This site reports that parking meter accept "bancomat" (debit card). An alternative would be to buy a pre-paid Verona Park coupon. 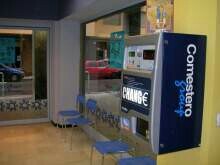 Walk into a bank with €25 and ask for a coin roll of 1 Euro coins. You will get a yellow roll with 25 of them in exchange. You can also get a purple roll of 2 Euro coins for €50. Not the answer you're looking for? Browse other questions tagged money italy tips-and-tricks local-customs verona or ask your own question. How do I get money back for my foreign coins? How much cash should I carry for driving a rental car in Italy? How can I reduce expenses on currency conversions?